Talking about Android, Google has been running this OS successfully for last 10 years and counting. Also, Android is now present on the majority of devices running around the world. It is also known that Google and Android are very tightly bound to each other. This means that there is a so-called Google Ecosystem present on every Android device around the world excluding China. As far as this ecosystem is called, it consists of apps like Google Maps, Gmail, and Google Play Store etc. However, there are times when the storage on our devices would get filled up and we need to remove some application from the smartphone to remove the “phone is running low on space” error. At that time, you start to wonder which apps are really important for your device and which ones are not. One such application found on most of the devices running Android KitKat and above is the Android System WebView. Here, we will give you all the information about it and also help you decide if this application is worth taking space up on your smartphone or you are better off uninstalling this. 6. Should You Disable it? Android System WebView is an application developed by Google and packed with Android’s latest versions. It is a component powered by Google’s Chrome browser which allows apps to show links without the need of opening a browser and you don’t even need to close that application as well. Now, what this means is that you might not even know if your device has Android System WebView or not but it does its job particularly well. This application is particularly helpful when we are browsing through a particular application and we need to open the link embedded inside that app. For this, we had to copy the link and paste in our browser of choice earlier or we were redirected to a browser when we clicked the link. Same is not the case now as the links get opened in the app itself. To simplify things for you, we will take an example of Facebook which most of us are using on a daily basis. Now, you might have noticed from recent times that whenever you open a link inside Facebook then you are not redirected to Chrome or Firefox. Instead, the link opens in the same window where Facebook was earlier opened. This link gets opened in Android System WebView which, as we mentioned earlier, is a Chrome-powered component. Thus, it contains most of the functionality that Chrome has such as zooming, scrolling, searching and most of the things that you need for a quick reading experience. Google developed Android System WebView with a view that the user does not have to close the application to open an external link. For this reason, Android System WebView was bundled with Android 4.3 so that everyone can get it as they update the version of Android. However, Google later separated it from the Android package and uploaded it to the Google Play Store. The reason for separating Android System WebView from the core of Android is not revealed by the company. The main reason was that there were some vulnerabilities found in Android System WebView and to fix it, Google had to release an update for Android. 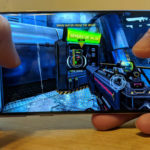 Now, the fragmentation in Android OS is well-known and most of the Android devices apart from Google-manufactured ones get Android updates a year later since release. This means that the vulnerabilities could affect many Android users. Now, Google has changed the working of Android System WebView even more in the recent versions of Android. With the release of Android 5.0 Lollipop, it is installed and enabled by default on our smartphones and there is no need to perform any steps if you are running the latest version of Android. Google has always emphasized the fact that Android Developers need to adapt their applications to the latest features on Android. Same is the case with Android System WebView which can be easily added to any application. In case you are an app developer then you need to include WebView library inside your application and create an instance of WebView class. This will embed a mini browser inside the application which will open the web pages inside the application itself. However, it needs to be mentioned that the Android System WebView has not exactly achieved all that Google expected it to. For this, Android Developers are also partly responsible as there is a lack of integration of Android System WebView inside Android apps. This is also a reason why some of the links still open in a browser rather than opening inside the application itself. One more aspect here is the Google Apps package also known as GApps package which is flashed on devices running Custom ROMs. It is known that Custom ROMs come with Google Apps as they need to go through certification which takes way too much time and resources. Therefore, you need to install Google Apps separately in order to get the apps on your device. For this, you need to download the GApps package from a GApps provider. You can download this GApps package from a portal named as Open GApps. Now, if you want to install Android System WebView as well then you need to compulsorily select a Stock package or above. 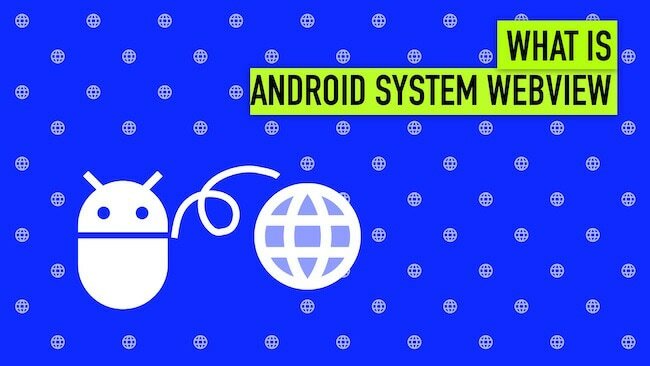 Now, if you are having an Android device running Android Nougat or Android Oreo then you are definitely not going to find Android System WebView. There is nothing to worry if this is the case as Google changed their mind recently and have removed it in favor of Google Chrome since the release of Android Nougat. Therefore, if you are on Android Nougat then you might see it installed but you will find Android System WebView disable on your device. However, Google has entirely removed it in Android 8.0 Oreo and above. 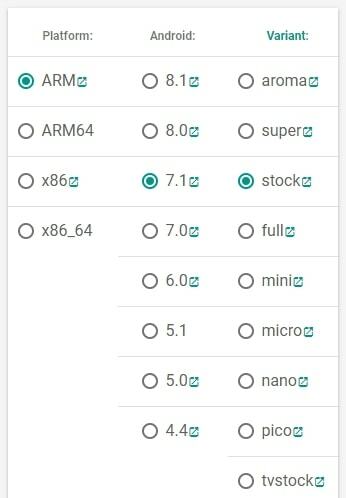 On opening Android System WebView in the Google Play Store on our device running Android 8.1 Oreo, we were not able to find the install button which is the case when you browse on devices running Android Marshmallow and lower. There is no option to enable or disable this application on our device as well. This is because Google has entirely switched their focus on Google Chrome. On devices running Android Oreo and above, Google Chrome will be opening WebView links rather than having a standalone Android System WebView for it. 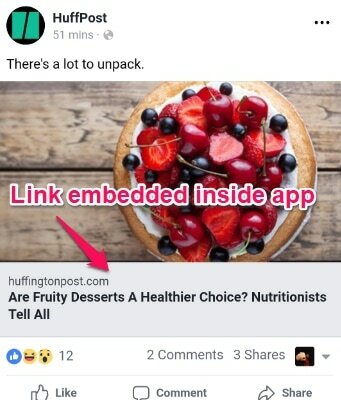 This, according to the Android creator, it is an energy-efficient way given the fact that Chrome should be enabled to render links on your smartphone. If you want to know whether you should uninstall Android System WebView from your smartphone then we simply advise not to do it. This is because it is a very useful application present on your Android device as we have explained above. Apart from that, it comes pre-loaded on most of the devices which mean you cannot uninstall it from your device. However, you have the option to enable or disable it at your will. For users with Android Oreo devices and above, you do not have to worry as the application is not present at all on your smartphones. We have come to the end of this article and expect you to be informed about how to use Android System WebView. Also, you should have learned that it is an important application on your smartphone so you should not remove it. 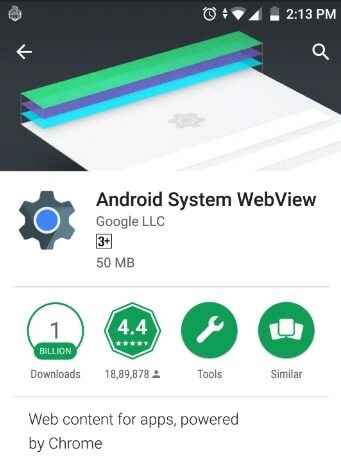 On devices running Android Nougat, this application is disabled by default so if you want to try it out then you will get the information about how to enable Android System WebView. However, there is no point in keeping this application on devices running Android Oreo and above. Thus, you shall remove this app if it is present on your smartphone.